I find it harder and harder to hold glasses without dropping them or having to physically maneuver my fingers and thumb around the outside. Plastic is great, but can smell after awhile and doesn’t really please me aesthetically. But then I was introduced to Tervis! My life has changed! They are made-in-America, double-walled, BPA-free, insulated plastic tumblers. They can be used for hot or cold liquids and even come with travel lids and straws for those who want to take them on the go (hi, me!)! The best part: They don’t feel like cheap plastic. They feel cute and beachy (I just purchased one with a sea turtle, one with bling-y flip-flops and one with Lab puppies!). The way the glass tapers, it allows for me to grip it normally and not feel as though I will drop it. Also, because they are insulated, the ice never melts! I left it overnight this week and woke up to ice cubes remaining! Another plus: They are dishwasher safe. All around, they rock my world! I don’t feel like I am settling for what works when I use these; I feel normal. 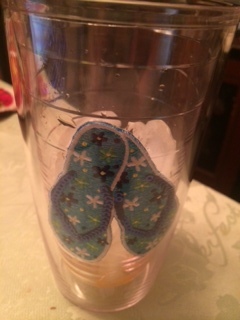 This entry was posted in disabled moms, Uncategorized and tagged BPA-free, chocolate Labs, CMT, disabled parent, Lab puppies, Made in America, Tervis. Bookmark the permalink.